NOAH: "I can still remember, I went to this Hip Hop concert in Munich. I was 14, I think. There were 200 black German youths there. I flipped out. I was so happy. I didn't know there were so many. Blacks aren't such a small minority in Germany. Black Germans, you're talking about a hundred thousand. And the blacks who live in Germany but don't have a German passport, that's another couple hundred thousand." 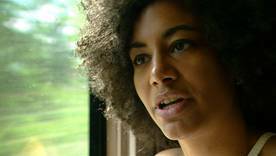 The documentary BLACK DEUTSCHLAND is an intimate exploration of black life in Germany. Featuring Darius James, Sam Meffire, Vincent Mewanu, Tyron Ricketts, Noah Sow a.o.